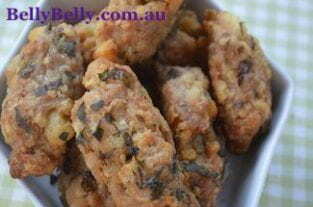 The are delicious croquettes, which can be used as a main meal or as a buffet dish at a party, or when your children have friends round for tea. Can be made in advance and stored in the freezer. They can be made using ordinary potatoes and any kind of ground or minced meat, such as chicken, turkey or beef. Heat oven to 175 C/350 F. Lightly grease a large baking tray, or two if necessary. Place your cooked potatoes into a large bowl and add the herbs. Mix in the diced onion and sausage meat. Mix thoroughly, using your hands so that everything is evenly combined. Season with a little salt and pepper. Put the beaten eggs into a shallow dish, and put the breadcrumbs next to them on a plate. On a clean board or lightly floured work surface, take a palmful of sausage meat and roll into a ball. Lightly flatten the mix with the palm of your hand and roll into 'sausage shapes'. Coat the sausage shapes in egg, then in breadcrumbs. Repeat the process again, egg followed by breadcrumbs, and place each one on to your baking sheets. You should be able to make 20 large ones or more if you make them 'party' size. Put the baking tray into the oven and bake for 25 minutes. Vary the meat mix with different minced or ground meat. You can add chopped chillies or some sweet chilli sauce to the mix before shaping, to give a bit of a kick! Make a really nice dip such as cucumber raita, smokey barbeque or salsa. Serve with simple vegetables such as peas and sweetcorn, or a nice shredded, buttered cabbage.